The end of rural doctors? "A boost to urban primary care at the expense of rural"
GPs in Scotland are set to vote on a new contract which aims to make general practice more attractive to new GPs. The new contract was announced last week in a joint exercise between the British Medical Association (BMA) Scottish GP’s Committee and the Scottish Government. It has now emerged that the effect of the contract will be to give a significant boost to urban primary care at the expense of rural services. The new funding formula will see cuts to rural NHS primary care services and around 90% of practices in the North of Scotland will see their allocated funding reduced by up to two-thirds. Although there is a promise of short term funding protection in the contract, the detail of this has not been provided, and this uncertainty looks set to destabilize rural healthcare across Scotland. "Things will become very much worse"
The Rural GP Association of Scotland (RGPAS) has expressed great concern to Scottish Government health officials and BMA representatives in the negotiating team. Dr David Hogg, Chair of RGPAS said “while we are delighted that some of our city-based GP colleagues are going to see a much-needed boost to their resources, it is very wrong that this should be at the expense of rural general practice. Rural patients, particularly those who are elderly, vulnerable or on low wages, rely more on local GP health services in order to access appropriate care. Rural GP teams provide a much wider range of services as we offer many treatments that would normally be provided in hospital. Much of this work remains unfunded. In addition, our members are called upon to administer life-saving care in remote areas, often for long periods before the ambulance arrives. Furthermore, recruiting GPs to rural practices is extremely challenging and the concerns of our younger members about the proposed contract indicate that this will become very much worse”. In an ongoing poll, almost all RGPAS members report a reduction in estimated funding allocation, with over a third reporting losses to their practices of 40-69%. 52% of RGPAS members said that without the offered short-term funding protection, the cuts would make their practice ‘critically unviable’. No Beatcroft Social this week - but a wee tribute, courtesy of those nice people at BBC Radio Orkney, to Malcom Young of AC/DC, who died last week. I thought it would be interesting to examine the strength-in-depth of AC/DC's songwriting, something revealed to me properly when I first heard Mark Kozalek's wonderful What's Next to the Moon? album, featured here. Sometimes these songs sound...elemental, like ancient blues or country. Dark, though. darker than they appear in what can be cartoon versions within the AC/DC performance oeuvre. Still, when you hear Malcolm's rhythm guitar, that (suitably modified and indeed recreated) ancient, single-pick-up Gretsch Jet, the sheer propulsion that allows Angus to soar and strut...AC/DC were irresistible. And despite it all, despite the deaths, the crimes, the disarray...they still are. You can play the show on Mixcloud as usual from the embedded player below, or go to the BBC iPlayer and stream it from there for around a month! I don’t think I’ve ever felt so powerless. I’m living under a dangerously incompetent UK Government. But worse than that, it’s weak, at war with itself, beset with lies, half-truths and cynical self interest. It has permitted some really toxic elements in British society not just to express their opinions, but to weaponise them online through unaccountable spending, to engineer the electoral process for their own nefarious purposes. It has encouraged an atmosphere where vicious, violent crime against people, even elected members, whose opinions are not shared by the bullies and bigots, can be promoted and perpetrated. And all of this in a technological context where control, surveillance and manipulation of the public is being allowed to run rampant. I live in Scotland, a Scotland which even a year ago seemed capable of taking a different path. Which had, in the European referendum, voted - if not as resoundingly as one might have hoped - for cohesion, inclusivity, co-operation and openness. 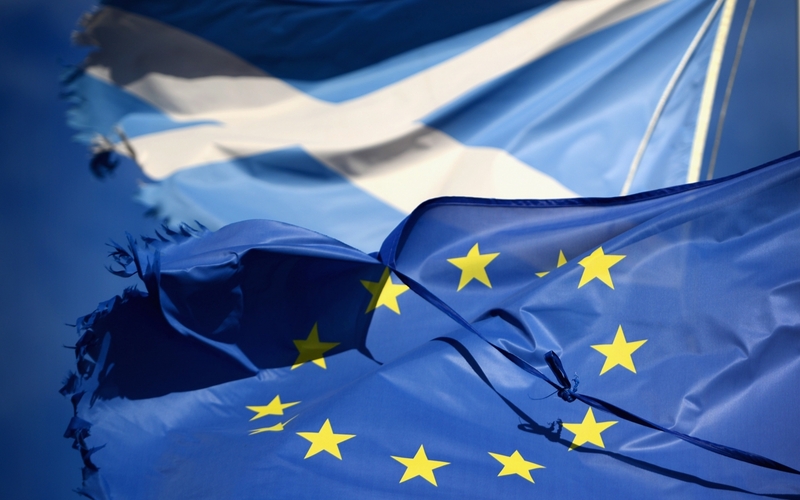 I felt embarrassed by my previous campaigning, in the far-off days of the Scottish Independence Referendum, confidently asserting that a vote for independence would remove us from Europe. 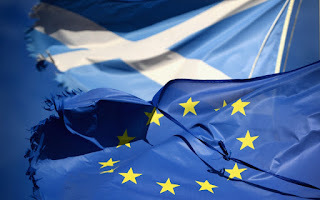 I shifted my view towards what seemed a possible solution - Scotland in Europe, separate from a UK which seemed to be slipping towards an appalling mixture of brutal stupidity and tyranny. But since then there has been political stasis in Scotland, with an SNP leadership uncertain how to proceed and a Labour Party apparently intent on savaging itself from within into irrelevance: And I understand the problem for Nicola and her cohorts: everything indicates that in the current climate of abject terror about the future, any second referendum for Scottish independence would bring defeat for and possibly a major fracturing of the SNP. The last thing the EU or this tottering Westminster administration wants now, as negotiations on Brexit range from flailing idiocy to dumb intransigence, is for that to be complicated by events north of the border. If there was a determined push for indyref 2, I could see London taking really drastic steps to stop it, moves that would make events in Catalonia seem like an episode from I’m a Celebrity Get Me Out of Here. Apart from anything else, the UK cannot afford to lose Scotland - it’s oil and gas, its whisky, its strategic geography, its nuclear weaponry - in the face of exit from all that Europe is and represents. For the time being, Scotland will simply not be allowed to secede. But Nicola has the Braveheartian elements within her party to consider. The anti-tax rise tartan Tories. The immigrant-hating element of escapees to ‘pure’ Scotland. And those who despise England, along with all who sail or sailed in her. There’s realpolitik. And there’s a need to keep the saltires fluttering and the bagpipes inflated. Meanwhile, Labour is in the grip of romantic leftism - to which I am not immune - I mean, Jeremy Corbyn, like me,once owned an MZ motorbike and rode it to Portugal and back; no-one else in politics, aside possibly from the legendary Hugh Kerr, can say such a thing. But come the crunch of yet another general election, can Labour, hopelessly compromised on Europe and beset with ugly internal conflicts ranging from anti-semitism through sexual harassment to the shameful vilification of Kezia Dugdale (but not by The Beloved Jeremy), actually win? In this torrid atmosphere of hate crime and the ruthless, moneyed exploitation of social media by so-far unidentified forces of the extreme right? And whither Scotland? The SNP Government seems to be desperately pushing for the retention of Holyrood powers that could easily be sacrificed by Boris, ‘Red Mike’ Gove and their chums. While facing a meltdown in public services, notably health, which can only be addressed by tax increases. A route it is poised to take, but understands could alienate yet another element of nationalist support. 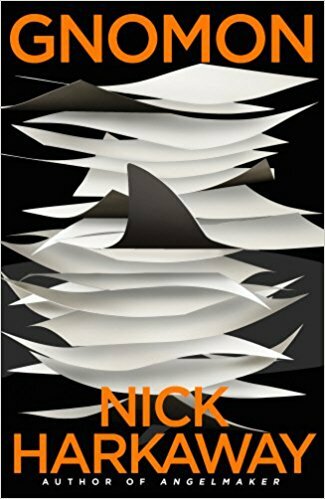 I am writing this after finishing Nick Harkaway’s hugely disturbing, vastly entertaining and - let’s be honest - quite difficult and very long book Gnomon. On the face of it, and to simplify drastically,Gnomon is a doorstop of dystopian sci-fi which reads at times like a brainstorming session involving Neal Stephenson, William Gibson and the late Iain (M) Banks. But it’s really a book about Brexit Britain, about the surveillance state, about how we ignore digital manipulation by Government at our peril. At how the evil in our society lurks, waiting to assume control. It’s also about nationalism, dictatorship and how worldwide, we are reaping the whirlwind of identity politics. Which of course brings me back to Scotland. Is the unutterable mess the UK wallows in right now a result of Scotland’s kicking against the Westminster pricks? Did Scotland’s drive for independence, all starry-eyed and moral, liberating and socially liberal, unleash the poisonous forces of brutal, racist, skinhead Little Englandism? There was undoubtedly an element of reaction. 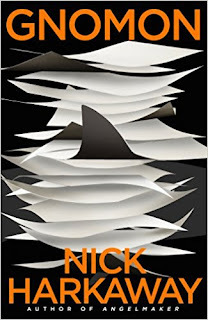 But amid the Greek gods and Ethiopian art, the demons, sharks and books (because Gnomon is about books as much as politics, including arcane pulp references such as the word ‘Forsythean’ as in Frederick, and a submarine called Rebus) Nick Harkaway identifies a worldwide retreat into parochialism, fuelled by the ever-encroaching power of the internet. Scotland’s wee story is more symptom than cause. What to do now? What can we do? My faith, I have to say, is in the power of words. Not this book, or not only Gnomon, but the fantastic journalistic work being done to uncover the way the Brexit referendum was corrupted and manipulated by those who stand to gain most from it. And I don’t just mean the Russians. Janglecrunch! Beatcroft Social for 18 November - the Rickenbacker 12-string special! 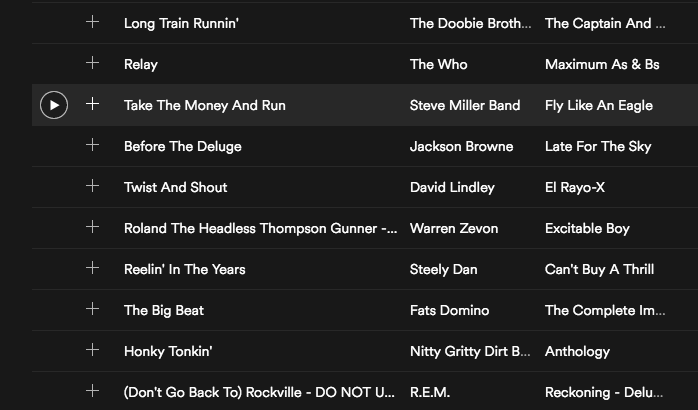 As suggested by Mr Ali Wilson and confirmed by Mr Lindsay Hutton, this is a selection of some favourite songs featuring the Rickenbacker 360/12 electric guitar, or variants thereof (though I sneaked in some Voxes, a Baldwin and maybe a Burns and a Shergold). Never having played a Rickenbacker, been close enough to a stage to see properly or even seen one in a shop, I did not know until right now that they're strung with the pairs of octave strings the other way round from an acoustic 12-string, of which I've owned far too many. You hit the thick strings first on the downward strum. All part of that distinctive twangle. Oh, and if you fancy a brand new Rickenbacker 360/12, it will set you back a whopping £3980 if you pay the list price in the UK. Though I see Gear4 Music has it for £3280. Err...bargain! 1982. 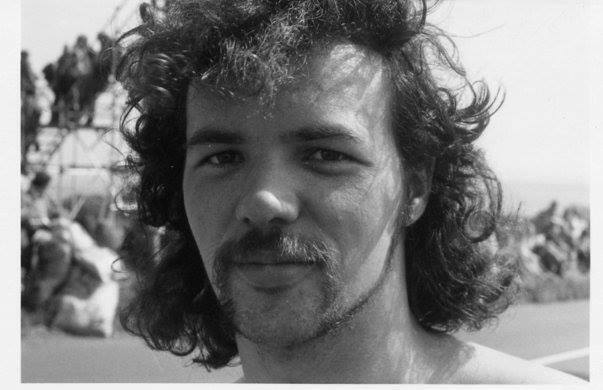 I was a worship leader, on occasion, kind of. A singer and guitar player. A songwriter. An evangelist. I'd been prayed over, blessed, sent forth with the laying on of hands and everything. I spoke, or at least muttered, in tongues. I was a full-time worker for God, part of a mission team called Scotroc, which sounds now (and sounded then) like a form of cooking chocolate. For a year or so we (Anne, my wife, and Sandy, my son) had been living in a Charismatic community at Overtoun House near Dumbarton. With second son David on the way, we'd moved out, back to Glasgow, but things were moving - personally, spiritually, emotionally - towards utter meltdown. Faith was falling apart. So was every other aspect of life. But it was happening in the context of having to play, perform, witness, preach and pray in order to live. It was a job. It was what I did. It was who I was. And I was getting to the point where I didn't believe in who I was anymore. At this point, I'd recorded two previous 'Christian' albums, both released on vinyl, almost all sold at concerts. Now I was trying to write my way through the crisis in my life. The result was this cassette, full of songs which veer schizophrenically from the full-on worship anthems like I Am Empty to desperate, paranoid Costello-lite rants like Loose Talk Costs Lives. There are songs of guilt and depression, and increasingly stark portrayals of a God who seems to delight in inflicting suffering. Pain seems to be the only solution. Contrasted with an immersion in religion both fuzzily reassuring and apocalyptically crushing, bloody and cruel. 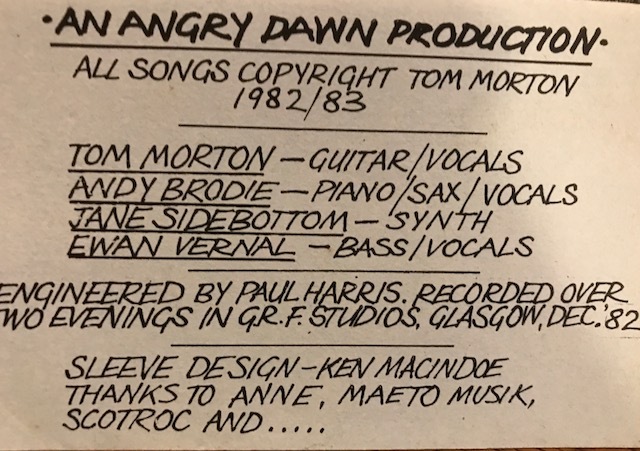 Amid all of this, watching my disintegration with no doubt some astonishment and discomfort (I never asked), were some amazing young musicians (and I was only 26). Jane Sidebottom, Ewen Vernal and Andy Brodie. I'm pretty sure Ewen was only 17. All were members of the Scotroc team. 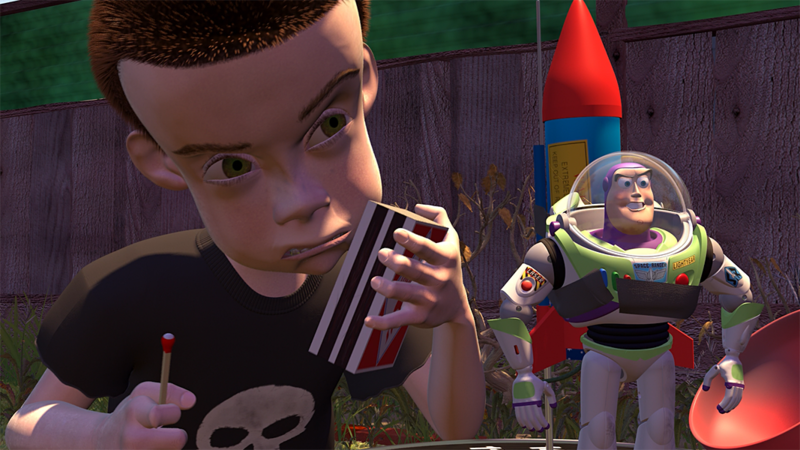 Both Andy and Ewen would become highly successful professional players. They have their own stories to tell, and I won't trespass on them here. It was a delight to meet Jane again last year - at an Aberdeen University ceremony. We both had children graduating. 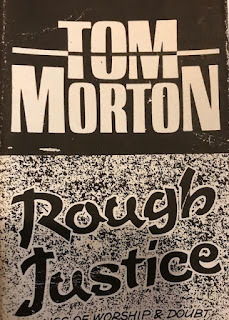 Anyway, I was provoked into rummaging through various nooks and crannies, digging out my only copy of Rough Justice and transferring it into the digital realm, by a mention the other day on Facebook. The Lion Will Return (Narnia in open 'G') is apparently still worthy of inclusion in a sermon. I must admit I do wonder if any of the explicitly worshipful choruses ever surface in churches, or if my cheerfully backslidden state has rendered them unholy. 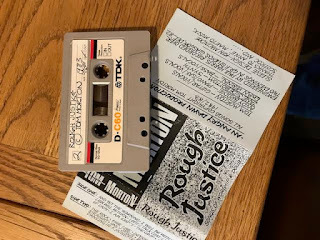 The tape was recorded over two December days in 1982, almost exactly, as I say, 35 years ago. In the old Gospel Radio Fellowship two-track studio in Argyle Street, Glasgow, live. What you hear is not of the best quality. The only copy I have is a TDK D60 copy made from a cassette, which wasn't that great to start with. But listen hard and you'll hear some of the best fretless bass playing any Bishopbriggs 17-year-old has ever recorded. Some wonderful sax and piano. And, may I be forgiven, some guitar playing I had forgotten I was ever capable of. Some of Rough Justice is hard going. Some is well, rough. Some is awful. Some is pretty good, I think. About the noise, the raucous roaring? So come, oh, spacemen and women too! Unst surely welcomes all of you! Recorded last week, and a real classic rock wallow (with the exception of the excellent Blue Rose Code of course). Currently in Inverness, but should be back home on Sunday. It's been a blast here in Dolphinsludge, Queen of the Highland Fleshpots, and I may fit in a quick trip to Glasgow tomorrow (Saturday). But the northern isles (and Dexter) are calling! The Vietnam War was the first televised, image-mongering conflict, and visual portrayals of it possessed my TV-watching childhood and youth. Some remain imprinted not just on my memory, but on the watching world's: Eddie Adams' photograph of South Vietnamese police chief Gen. Nguyen Ngoc Loan killing a Viet Cong suspect; Nick Ut's astonishing, opinion-altering shot (and a BBC crew's film) of a napalm-burned child, Kim Phuc. many, many more. It was a movie war, too: At least three classics - Apocalypse Now, The Deerhunter, Full Metal Jacket. 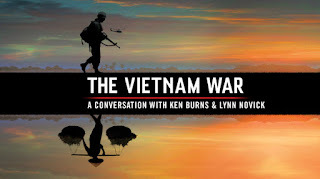 And so Ken Burn's recent TV documentary series had a difficult job: to enliven and indeed remake those images in the minds of those who had seen them many times before. To find new ones. And to deal with the fact that it was also a war soundtracked by some of the best pop and rock music ever made, indeed, inspiring much of it. 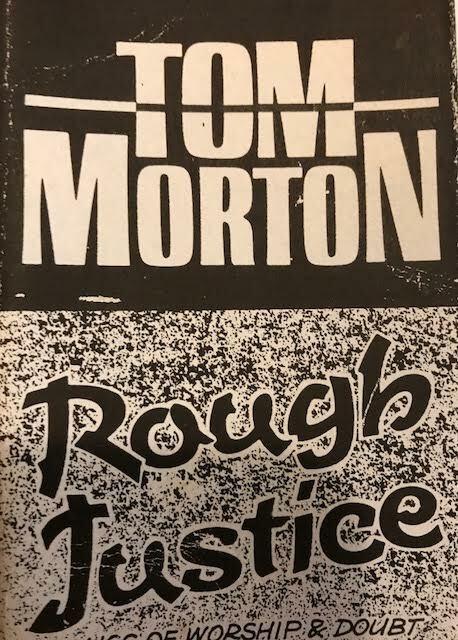 It was the music that for me joined up the straight conflict reportage with the wider history of what was an incredibly turbulent time in world politics. Ken Burns used some of the best-known and lesser-remembered tracks of the time (with added original music from Nine Inch Nails' Trent Reznor) to weld together a masterful series which combined intensely moving interviews with participants from all sides with music, moving and still pictures. Brilliantly. How powerful were these songs? How bleak and terrifying are the Stones on Gimme Shelter? 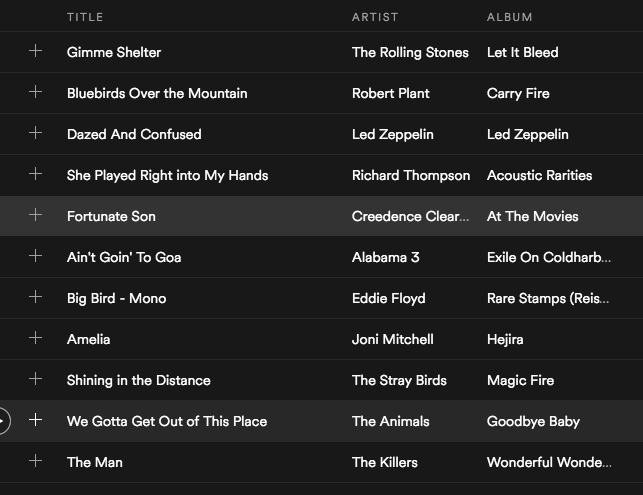 How ragingly appalled John Fogerty on Fortunate Son? And contrast today's wearily cynical anthem from The Killers, The Man. It's a good song, smart; but it has no real anger, no social power. Where are those songs that can change everything? Mean everything? And help us remember everything? Beatcroft Social 13 October 2017. 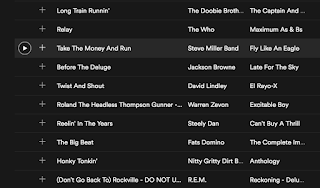 A mere snippet of Susan Bowie's 60th Birthday bash playlist! Only an hour long this week, as I'm running about organising food, drink and shenanigans for Susan's bash tonight. 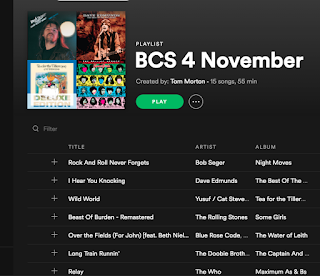 But if you have Spotify, enjoy four hours and 40 minutes of dance-party-soul-pop-rock and extend your listening! Thomas Earl Petty. I think it was the fact he was such an evident fan, that the music he loved was so obviously in the music he made, yet forged into something very much his own. Roger McGuinn of The Byrds is alleged to have heard American Girl and puzzled over the notion that he couldn't remember writing and recording the song. But the merging of that Rickenbacker 12-string jangle with the raunch of the Stones, the harmonies of the Beatles, the mordant lyrical wit of Dylan, classic US garage rock and southern soul, brought us this astonishingly powerful 40-year career. And let's not forget - it was Britain where he broke through first. There was an initial aversion in the US to his spindly, too-pretty androgyny. It was only later that he was adopted as 'heartland' and there was always a distance, a suspicion. Those songs. From the soaring emotional power of The Waiting and the desperate obduracy of Refugee to the whimsical cynicism of Into The Great Wide Open ("under the sky so blue...a rebel without a clue") and his LA masterpiece, Free Falling, he had a mystery and a vision that seemed effortless, but was the product of determination and sheer hard work. Yet he made Springsteen seem bludgeoning and occasionally lumbering. Floated like a butterfly, stung like a bee. I could go on and on. Instead, watch Peter Bogdanovich's superb 4-hour documentary Runnin' Down A Dream, the best rock biopic ever. It's on Netflix. Listen to the music. It's been a foul couple of days of weather since I got back from Glasgow - meaning I had to cancel a proposed trip to Unst to film an STV news story. It's all very well showing Shetland in bad weather, but impossible, really, if you can't keep the camera steady and your voice disappears in a buffeting of wind. It is dull, Son of Adam, to drink without eating," said the Queen presently. "What would you like best to eat?" "Turkish Delight, please, your Majesty," said Edmund. The Queen let another drop fall from her bottle on to the snow, and instantly there appeared a round box, tied with green silk ribbon, which, when opened, turned out to contain several pounds of the best Turkish Delight. Each piece was sweet and light to the very centre and Edmund had never tasted anything more delicious. 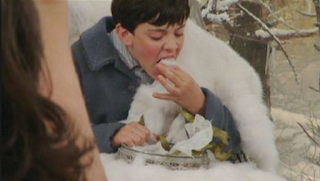 I hitched a ride on Jadis’s sled and gobbled up the Turkish Delight. Or to be precise, drank the (got to be Gordon’s) Gin and Fever Tree tonic (a sky-high £6.30, though I had my choice of ‘artisan’ gins and ‘craft’ beers for similar money). And of course I wasn’t travelling on a sled hauled by bedazzled white reindeer through the snowy wastes of Narnia, but aboard a Flybe/Eastern Airways Embraer 170 jet from Sumburgh in the Zetlandic Archipelago to Glasgow in Greater Scotia. Which took 52 minutes and cost £134 return - though only because the atrocious Flyby website fooled me into paying for ‘my choice of seat’. That’s with my Shetland resident’s Air Discount Scheme reduction of around a third. Five minutes before we whooshed into the - for once - clear and calm Shetlandic skies, a turboprop, 50-seater Saab 2000 used by Loganair had taken off, also bound for Glasgow. It would take marginally longer, cost pretty much the same, and was more than half empty with maybe 20 passengers. The rather lovely Embraer 170 (two cabin crew, brand new leather upholstery) can take 76, and had 14 customers aboard. As I walked across the tarmac, I chatted to a fellow jetsetter, who grumbled that he would personally have much rather gone with Loganair, but hadn’t been given a choice by his company. I muttered my support for his point of view, failing to point out that in fact the Embraer has big enough overhead lockers to accommodate proper, free, small-suitcase hand luggage, unlike Loganair’s compact and bijoux Saab 340s and their one bigger 2000. 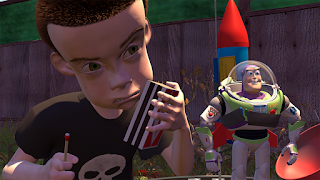 But the terrible truth is, I just wanted to go on a jet. In 39 years of travelling to and from Shetland, it had been nothing but propellers for me, from Viscounts and HS748 ‘Budgies’ through the horrendous Shorts 360 ‘Flying Skips’ and the made-in-Scotland Jetstreams. Plus the occasional Fokker Friendship and even a Twin Otter or two. So I booked Flybe, not Loganair. The two airlines (Flybe backed by the muscle of Eastern) have been competing on the Scottish island routes since 1 September, after Loganair, who for a decade operated the services under the Flybe flag, decided they would take the job on themselves. Provoking Flybe to go into full commercial air war mode and provide alternative services, in Shetland’s case by using the aforementioned luxury jet (just one, which has to buzz about from Sumburgh to the various Scottish airports in a frenzy of fumes. Three Aberdeen flights and one each to Edinburgh and Glasgow). Prices fell and were duly matched, almost pound for pound. Advertising campaigns were launched, including what I’d guess is the biggest-value single advert in the history of The Shetland Times (a full four-page Flybe wraparound). There was a starry-eyed sensation among some Shetlanders that they had never had it so good, and among others that we were entering a mad race to monopoly which could see Loganair forced out of business. Edmund tried to remember that it is rude to speak with one's mouth full, but he soon forgot about this and thought only of trying to shovel down as much Turkish Delight as he could, and the more he ate the more he wanted to eat, and he never asked himself why the Queen should be so inquisitive. It would be daft to lionise Loganair, however. No-one really knows what led up to their decision to pull out of the Flybe franchise deal, and sheer greed may, as usual, have played a considerable part. Listen, they even gave me a free plastic luggage tag. And they have this 'code sharing' deal which means you can book a route straight through involving British Airways. The wee plaid Paisley buddies are putting a brave face on things for the moment, claiming a year-on-year rise in passenger numbers since the start of September. Flybe is more cautious, stating that it is ‘generally pleased’ with how things were going. 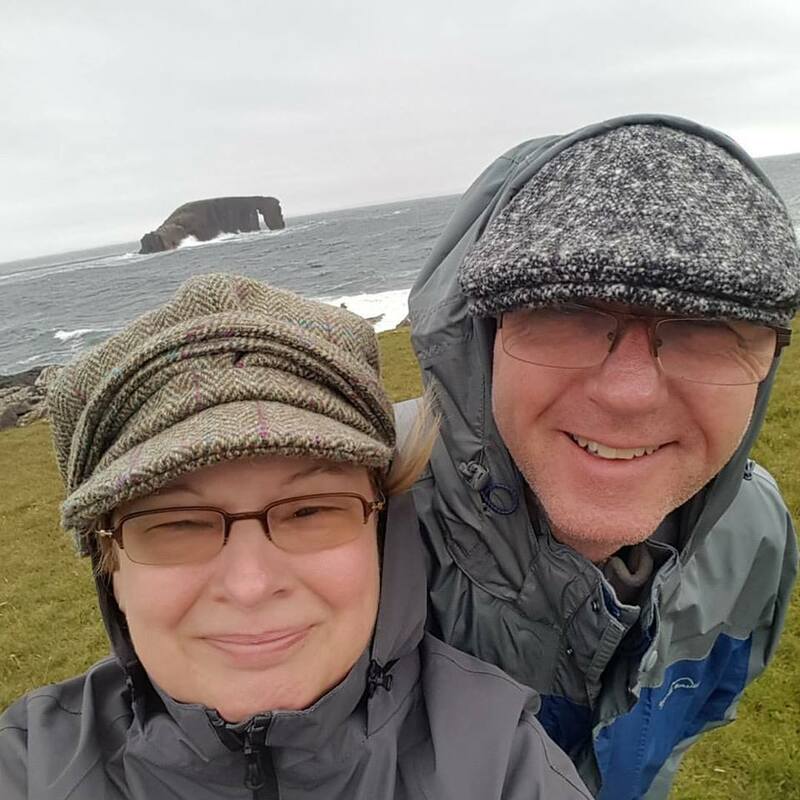 You can read both sides of the ‘we’re winning’ story at The Shetland News, here: http://www.shetnews.co.uk/newsbites/15213-loganair-encouraged-by-rise-in-passenger-numbers . There have been problems in both camps with delays; The Embraer is not quite as wind-friendly as the venerable Saabs, and Loganair have long been cursed with ‘tech’ issues on what is an ageing fleet. As for me, I have not, like Edmund in The Lion, the Witch and the Wardrobe, been seduced into the Flybe camp for ever. I do worry that their tactics represent monopoly-seeking capitalism, red in tooth and claw, and are either purely gestural or a serious attempt to stretch Loganair’s finances until they snap. Do they serve Turkish Delight on board? I'll ask on the way back home. At last the Turkish Delight was all finished and Edmund was looking very hard at the empty box and wishing that she would ask him whether he would like some more. 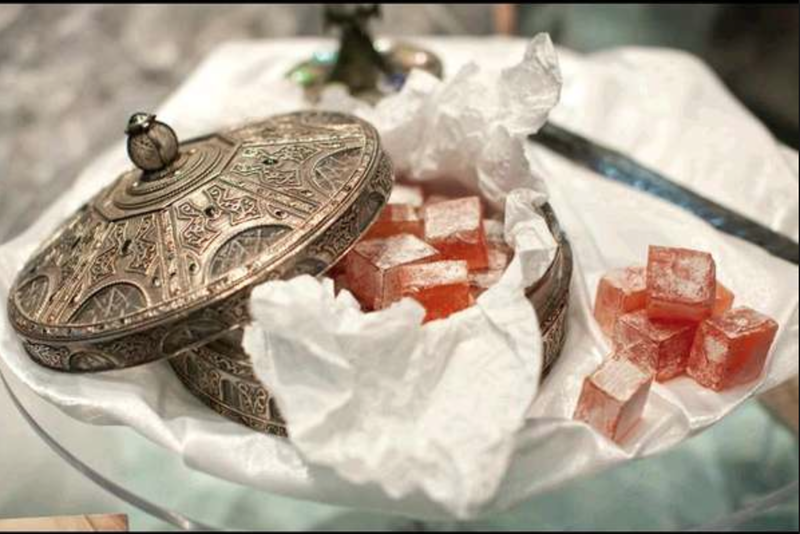 Probably the Queen knew quite well what he was thinking, for she knew, though Edmund did not, that this was enchanted Turkish Delight and that anyone who had once tasted it would want more and more of it, and would even, if they were allowed, go on eating it till they killed themselves. But she did not offer him any more. 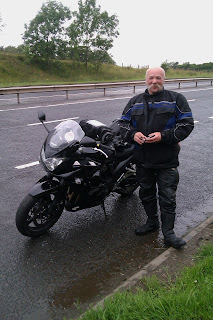 Och, it's seven or so years since that picture was taken, at a lay-by on the A77, just before the Kilmarnock turn-off. Hugh had met me and Rob Allanson (we were on borrowed Triumph Street Triples; I nearly totalled mine at the Bushmills Distillery, but that's another story) near Carrbridge and accompanied us south. We were heading for Wigtown, but everything went a bit pear-shaped near Stirling, with Rob zooming off by accident towards Edinburgh, and the weather turning frightful. Hugh had been planning to come to Wigtown with us (Rob and me were heading off to Ireland afterwards) but went off to his hometown of Kilmarnock instead. This is where we said goodbye. And now we have to say goodbye to Hugh forever. 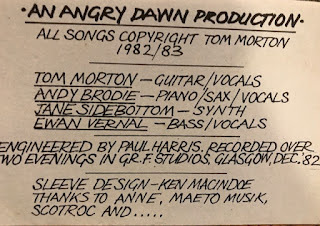 He was an extraordinary character, absolute stalwart supporter of the Tom Morton afternoon and evening shows on Radio Scotland, organiser of FOTTOMERS (Friends of the Tom Morton Evening Radio Show). 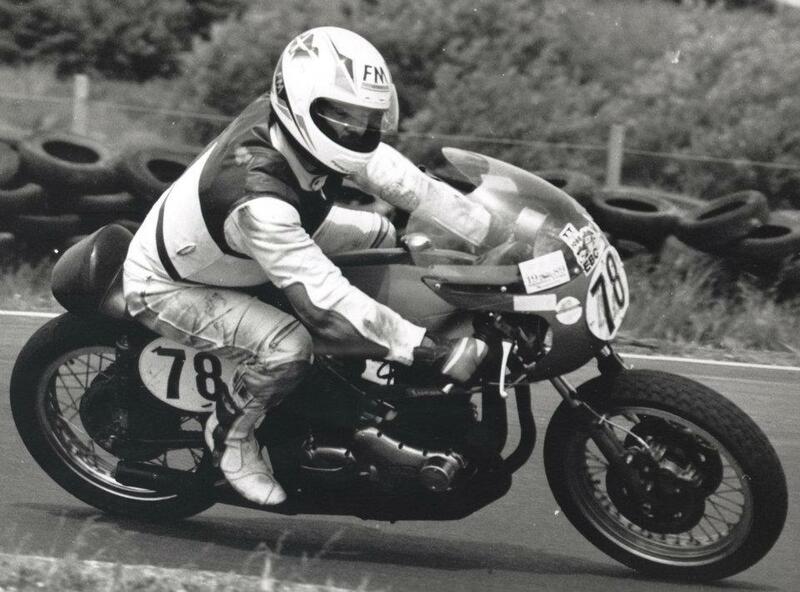 I talk a bit about him on this week's Beatcroft but there was so much more to say: his tales of offshore engineering, his musical adventures, motorcycling and stewarding at East Fortune, the cars, the crack, the characters. Those fantastic tales of derring-do in Volvo P1800s and Ford Mustangs. Incredible antics on helicopters over the North Sea. What happened at the Isle of Man. The guitars, the gigs. Hugh was kind, wild, thoughtful, generous, extreme, cautious, careful, completely over the top. There were shows he single-handedly rescued from tedium. Entertainment was his middle name. I twice nearly bought a bike from him, latterly a Honda Hornet which was all set to go on the boat north until there was a serious problem loading it onto a trailer at Hugh's home. In retrospect, I wondered whether it was the first sign of the illness that would lead to where we are now. Once, he nearly bought a bike from me. He frequently tried to interest me in buying one of his campervans. I'll miss him. His zest for life, his taste in music, his spirit of adventure. I've been trying to find pictures of the FOTTOMERS Malt and Barley Revue gig at Eurocentral, but perhaps this one sums up the spirit of the man. Much missed. Ride on. Steely Dan were always for the more cerebral among us, which kinda left me behind with my Uriah Heep, Steeleye Span (easy ordering mistake to make, maw) and Led Zep albums. The truth is, I always loved the very early stuff, from hearing 'Dallas' (still very difficult to find on CD and vinyl) the first single, on a Probe Records sampler which I still have. Don't get me wrong, I later grew to love Donald Fagen's voice, but David Palmer on 'Dallas' and 'Dirty Work' is fantastic. 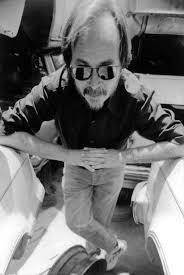 He went on to co-write with Carole King after Fagen's voice 'grew strong enough' for live work. And he's still around. Becker of course, departed the planet this week. While I've always found some of the Dan's work cold and, with its self-conscious virtuosity, alienating, I loved chunks of it and I will always remember a first family trip to Florida when we hired a massive SUV and headed from Miami to Orlando, a CD of Steely Dan's Greatest Hits providing the perfect accompaniment to freeway driving. Meanwhile, this week has seen Shetland beginning the withering into winter with the first equinoctial gales. 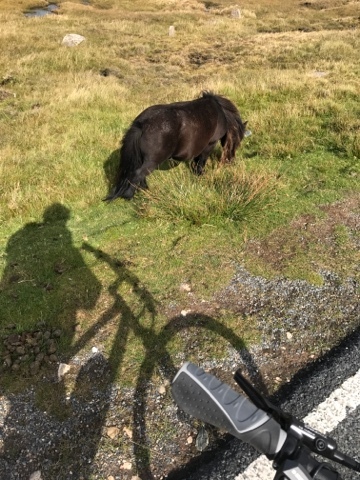 As you can see below, I did manage a splendid trip out on the electric bike, the ideal mode of travel for gentlemen of a certain age. Though it's coming up for end-of-motorbike season, which means there could be an MZ or BMW GS going cheap. Keeping an eye out anyway. 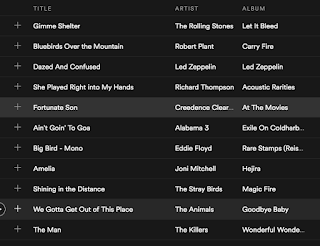 This week's playlist follows. 'Dallas' isn't on Spotify. ....then there appeared two carefully-constructed wooden walkways and a bridge, plus a stone, turf-roofed building. There was the sound of rushing water. After yesterday's torrential downpour, no surprise. 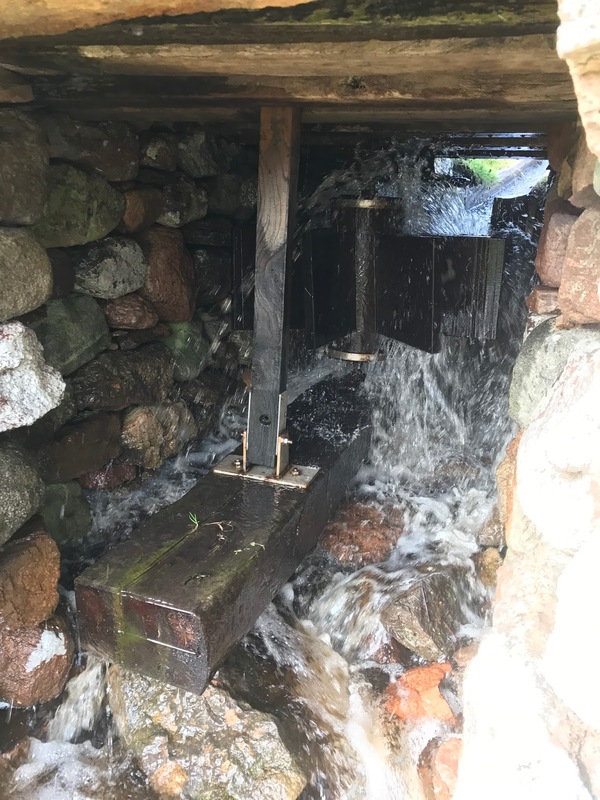 A notice explained that, a decade previously, with grant aid from some of the usual suspects (who had money for this sort of thing, back then) the Hillswick and Eshaness Area Regeneration and Development Association had restored (and essentially reconstructed) the watermill to full functionality. 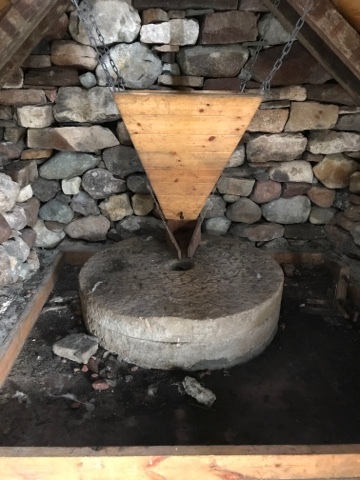 ...though the millstones weren't actually going round and round, because the horizontal mill wheel was jammed, either deliberately or through rustiness. Was I tempted to crawl in there and see if I could get it (and the stones) turning? Momentarily. The sensation passed. .and so it was back on the bike for the return trip. 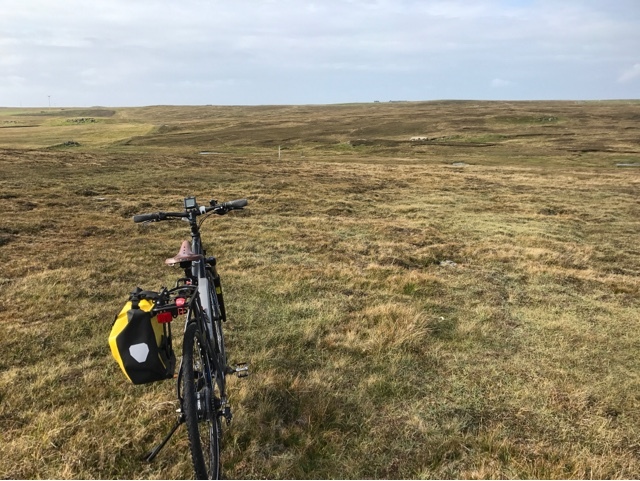 Alas, the Braewick Café was shut, but Martha had left some of her excellent espresso chocolate cupcakes in the fridge at home. Of which, relatively guilt-free, I duly partook. It's been quite a week - Shawn and Mark from Virginia, Neil from Crieff and Angela from Auchtermuchty came to visit - long-term friends of the various TM radio shows, and I thought it'd be good to get some song choices from them for the show. Actually, Mark and Shawn put together their own celebratory show for the visit which you can find on last week's posting here - every song themed to 'radio'. Oh, and I can't resist pointing out to the powers that think they know about promotion that Angela, Mark and Shawn have all considered moving to Shetland - and only because they discovered the place through the radio shows and the Promote Shetland webcams. 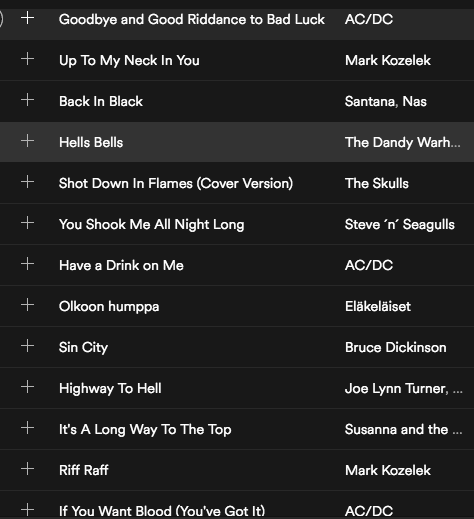 Shawn, as you will hear, chose several songs, which is fine, and I think you'll enjoy this "visitors' selection", along with my own. I can't get Richard Thompson's 'Guns Are The Tongues' out of my head at the moment'. And the new David Rawlings album, Poor David's Almanack, is marvellous. Just a quick word for two of the 'Fottomers' team who haven't been well recently - the founder of it all, Hugh Docherty, and Edward Johnson-Ott over in Indianapolis. Thinking about them. And in a week when most media attention has been on the awful flooding in Texas and now Louisiana, the last track - Stevie Ray Vaughan's Texas Flood - is also a call to remember the thousands who have died and the hundreds of thousands affected by terrible flooding in India, Bangladesh and Pakistan. Summer slipped away this week. 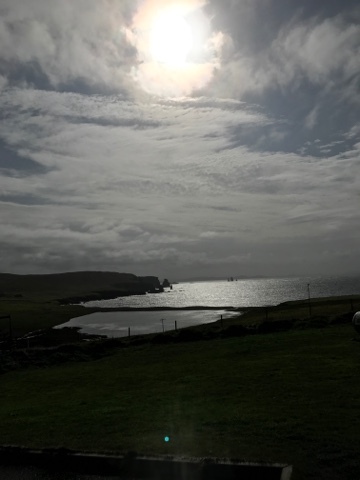 Shetland had two gloriously warm, sunny and ferociously midgey days, and then, as the nights began to make their darkness felt properly for the first time, the clouds descended, the rain started falling and then the wind began to blow. Anyway, here's the show. 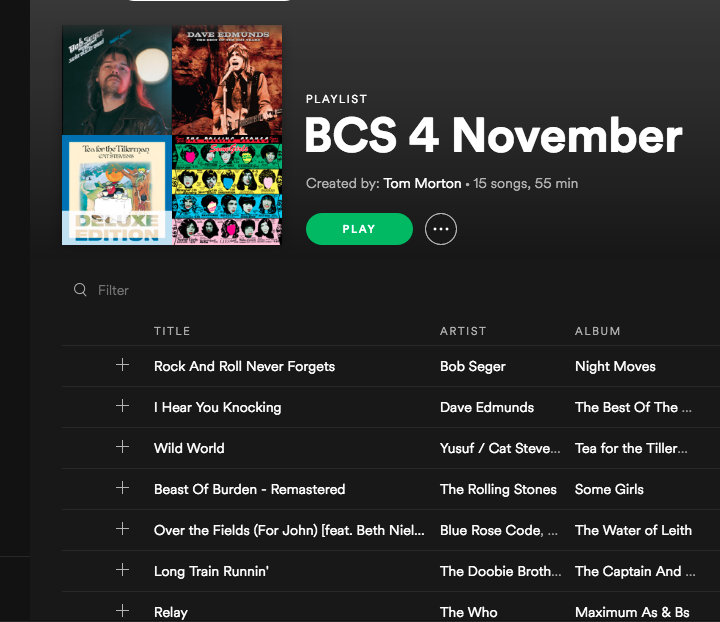 The Spotify playlist is at the bottom of the page, just after the lyric which in fact marked the last BBC late-night show I did, more than two years ago now. I'm still thrilled by so much music, new and old, and was thoroughly inspired by reading this Quietus piece by Joe Thompson of the band Hey Colossus. One of those weird weeks that start slowly with nothing much happening, then gradually accelerates until, on Thursday and Friday, you're running about like a mad thing trying to finish promised pieces of work...in my case, articles about Lumpfish and polytunnels. Such is the cutting edge investigative journalism that pays (at least some of the) bills. The weekly Beatcroft Social is always a pleasure, and here it is. 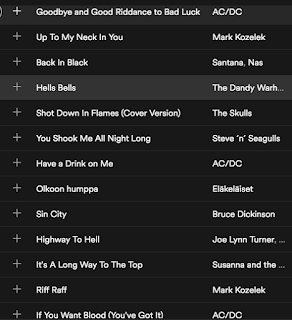 Spotify playlist (scroll right down...no, further) can be used if you wish to avoid my verbal rumblings. But I should say there is a great story about abandoning drummers in Texas on the Mixcloud stream. But hey, uh, nothing ever happens, does it? I’ve got some dried in a matchbox - they make a LOVELY crunch! It's been a hard but satisfying week, writing 30,000 words of a food book I'm collaborating on with my son James. Morning until night, writing in the same way I wrote Spirit of Adventure, Going Home and Red Guitars in Heaven. Is it any good? Time, James and our editors will tell. I think I get better the faster I go and the more I do, but that's the old hack in me talking. So I haven't been out much, or taking in much new music or media. It was impossible to miss though, the outpouring of affection and sense of loss that accompanied the death of Glen Campbell. 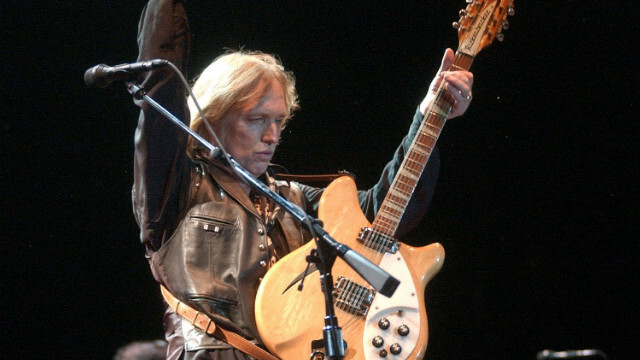 The Rolling Stone obituary was insightful, I thought, in quoting Tom Petty to the effect that Campbell was never cool, and you had to work a bit to get beyond the mom'n'pop right wing appeal - a point raised by my friend Audrey Gillan on social media. This after all, was the guy who, when he first met his lifelong friend and songwriting inspiration Jimmy Webb, said sternly: "Get your hair cut!" Posting a bit earlier than usual, here's The Beatcroft Social, fresh in after a two-week break. If you enjoy the show and want to support it, please buy a book or a lump of artiness via Etsy, Amazon or eBay - see the links on the right. There will be more artefacts up for sale in the course of the week from The Last Bookshop. I've been pondering the use of Patreon to support the show - it creates a kind of membership-by-subscription thing with added benefits for subscribers which I suppose might include special one-off shows, gigs, postcards, limited edition books and the like. I've always been averse to the whole crowdfunding culture, but Patreon is close to the way public radio is funded in the USA. Any thoughts welcome. iScot Magazine is a Scottish-independence-supporting online and print magazine, for which I’ve written extensively over the past two years, including a monthly whisky column. Its August edition sports a cover based on the 17th Century Rubens painting The Three Graces, with the heads of Ruth Davidson, Theresa May and DUP leader Arlene Foster superimposed. The original’s famous portrayal of nakedness has been modified with Photoshopped ‘modesty’ bands. This is a change from the much-trailed-on-social-media version of the cover, which featured crudely drawn-in ‘bikini’ patches. That first version, which was evidently aimed at creating controversy and attention - and succeeded in doing so - was condemned by a number of people associated with the independence movement, including Women For Indy board member and owner of Glasgow’s Yes Bar, Suzanne McLaughlin, as ‘misogynist and puerile’. I can only concur. The ‘modesty’ version which has ended up being published is in some ways worse, in that it references the controversy and demeans a piece of great art, reducing it to mere prurience. Ken has committed his savings, indeed his life to the magazine and has been a delightful and supportive person to work with over the past years. My own tentative move towards support for independence was narrated in the magazine, and while there were always issues with some of the less professional and occasionally peculiar contributions, the publication’s sheer existence against considerable odds has been extraordinary, and a real tribute to Ken’s commitment and energy. Over the past week, and indeed fuelled by the trailing of the August cover, a slow fund-raising and subscription campaign has accelerated and - heavily endorsed by the blog Wings Over Scotland - taken off, and it now seems the future of the magazine for the next year is secure. I, however, will not be writing for iScot in the future. It is ironic that my piece in the August edition reviews Rachel McCormack’s new book Chasing the Dram - a thoroughly feminist look at Scotland’s relationship with whisky. It would be easy to point to the extreme corners of the independence movement and identify lurking elements of sexism, homophobia and, as Neil Mackay, editor of the Sunday Herald said on (and about) Twitter this week, ‘dumb toxic bile’. You can find the same sentiments among unionists. But neither nationalism nor unionism is more important than respect for human beings. Than simple decency.